Almost every homeowner has a walkway, patio, or concrete stoop. 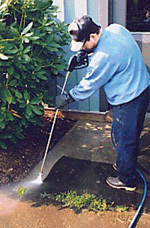 Concrete, slate, natural stone and all other types of sidewalks, patios and stoops around your house can be pressure washed to remove all mildew and dirt. Hard to remove algae growth is easily cleaned off safely and effectively with our 180 degree hot water pressure washing system. Using harsh detergent or bleach can be detrimental to surrounding surfaces and plantings. Our hot water system takes the worry out of using dangerous chemicals getting rid of harmful mold, mildew and dirt.